In the May 2018 issue of The Highland Woodturner, Temple Blackwood offers some helpful tips for doing a woodturning demonstration for a crowd of people. Going beyond the typical “keep things moving so people don’t get bored” advice we usually hear, Temple has great information about types of wood to use for a dramatic result, tricks for preparing for the demo and how to apply a finish without splashing your audience. In an effort to share my own passion for wood as a sensually rewarding material to work with in a concrete way and to communicate with both other people as well as with the source-trees, I developed a series of demonstrations using wood that clearly comes directly from the tree. 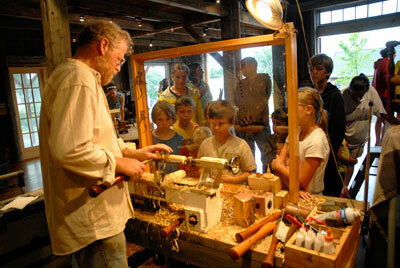 Click here to read more of Temple’s great article on How to Demonstrate Woodturning.